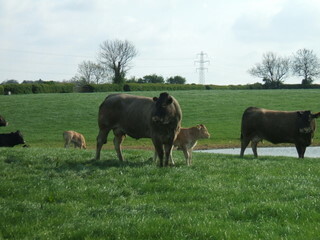 Robin and Gill Smith, Edmarc Herd, were one of the first farmers to bring Bazadaise cattle to the UK in 1989. Sadly, Robin died in April 2014. "We run a family farm in Leicestershire - mixed arable and beef. 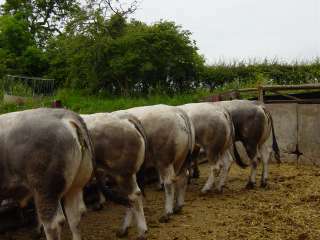 We have both a pedigree herd and BazX cows. It's all run by 2 people plus a little part time help occasionally.We chose Bazadaise because they were different to any other breed in the UK. They calve easily, walk well, last forever (our 19 and 17 year olds just calved again). They produce finest quality beef and have a fantastic meat to bone ratio. We have a first class reputation amongst buyers for consistant quality, both liveweight and deadweight. Buyers will pay a premium. They are managed as a commercial animal and fed home grown cereals and forage. The BazX Holstein makes an excellent commercial suckler cow. Easy to manage, nice tempered, lasts well and plenty of milk without the udder becoming distended. We feed home grown cereals with a little purchased protein, grass silage, maize silage, whole crop barley. 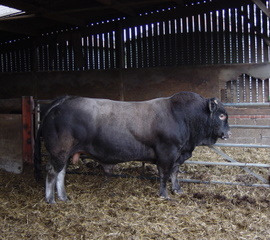 Bulls are finished on ad lib system. Everything is sold finished or selected bulls are sold for breeding. Some breeding females are sold from time to time."